We are a purebred bull operation. 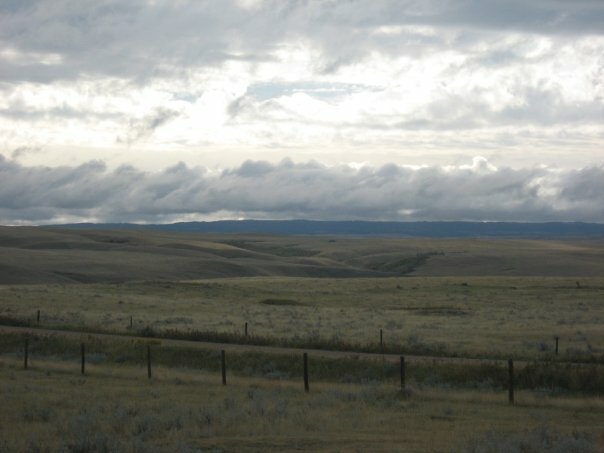 We purchase the elite bulls as we are breeding seed stock for the commercial cow calf producer that in turn producers the beef for the feedlot industry. On our farm we have one bull for every twenty-five cows. This means that they are a very vital part of our program. They are passing on their genetics at twenty-five times (give or take) the rate our females do. As such, we are very picky about the bulls we purchase as herd sires. We look for confirmation, pedigree and fertility. Bulls are sold in the spring time by auctions that are live or video sales across the country. We have countless sale catalogs and websites to comb through looking for the next great herd bull. 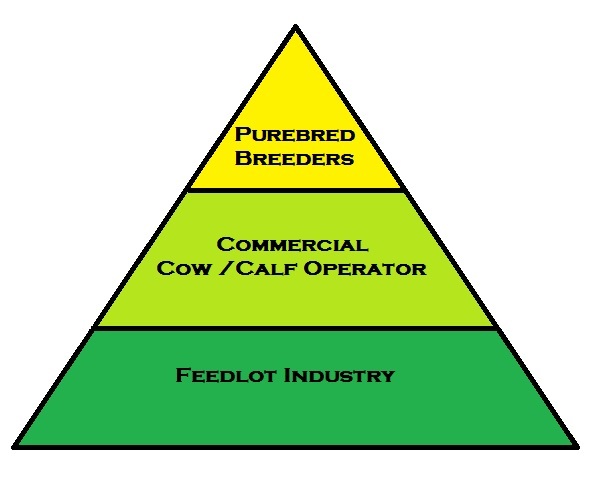 Overview of how purebred breeders fit in to the cattle industry. Each portion of the triangle feeds into to the level below in order to produce some the tastiest and safest beef in the world. This year, we are looking to purchase three new bulls. Cattle markets are extremely strong and as a result the purebred bull market is very competitive. We expect to invest $100,000 on the bulls and another $10,000 or so to insure the bulls for death or injury. Yesterday was an exciting day as we were able to buy one our next herd bulls. He has most everything we want in a bull: power, great hair and good conformation. It’s always a thrill so see if you can purchase the bull you want for the budget you have set, the excitement of the sale as well as visiting with fellow breeders. Since the purebred industry is a small portion of the cattle industry, we are a tight knit bunch that enjoys each other’s company while still promoting our specific programs. Next week we have our own bull sale. 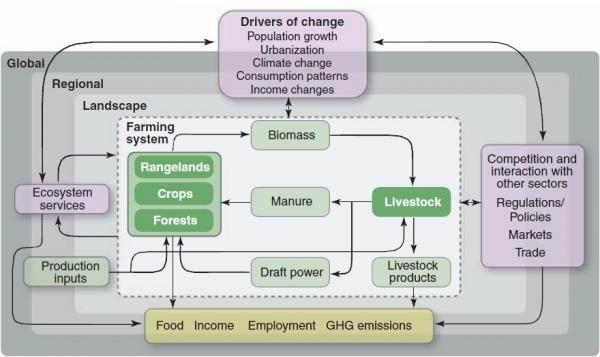 We manage our own sale and host the sale on farm. It is our major income event of the year. We sell a handful best of our bulls to other purebred breeders but the bulk majority goes to commercial cow calf producers to use in their cow herds. We put months of preparation into the sale developing the bulls properly through specific nutrition programs, marketing our cattle through local livestock shows, print and social media, as well as countless networking events. 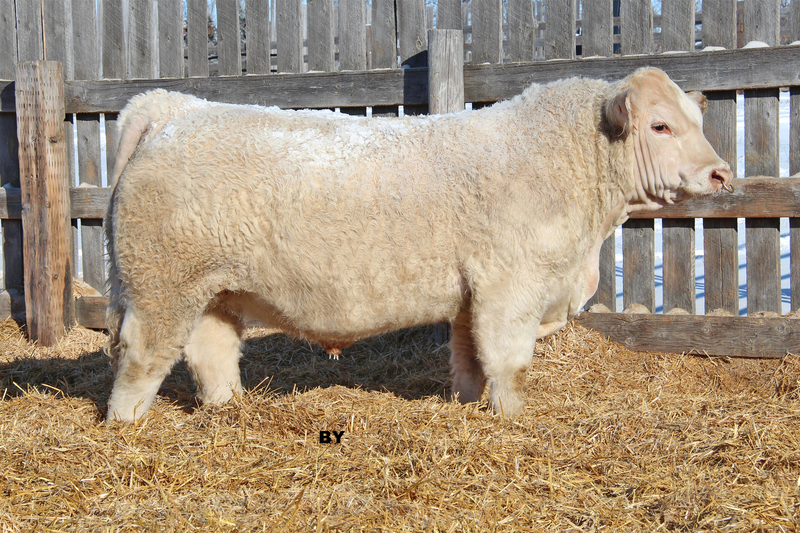 We will sell approximately 70 bulls this year. The next 5 days are a flurry of activity and excitement as we get our facilities and bulls ready for the big day. On Wednesday, we will sell the bulls via video auction to avoid stressing them by putting through a loud and unfamiliar auction ring. In about two hours the entire sale will be complete. An accumulation of year’s work will be complete and we will analyze our year and start planning for next season. This is a small selection of bull sale catalogs used to promote individual bull sales. Buyers select their bulls from the pens before the sale. It’s a full house on sale day. One of our herd sire on pasture with the cows. Oh the cuteness of the fuzzy baby bull calf! On our farm our cows have their babies starting in February until April, give or take a few early birds and stragglers. So what does that mean?? How does it work? Cows have babies once a year. We breed our cows to have their in February or so. 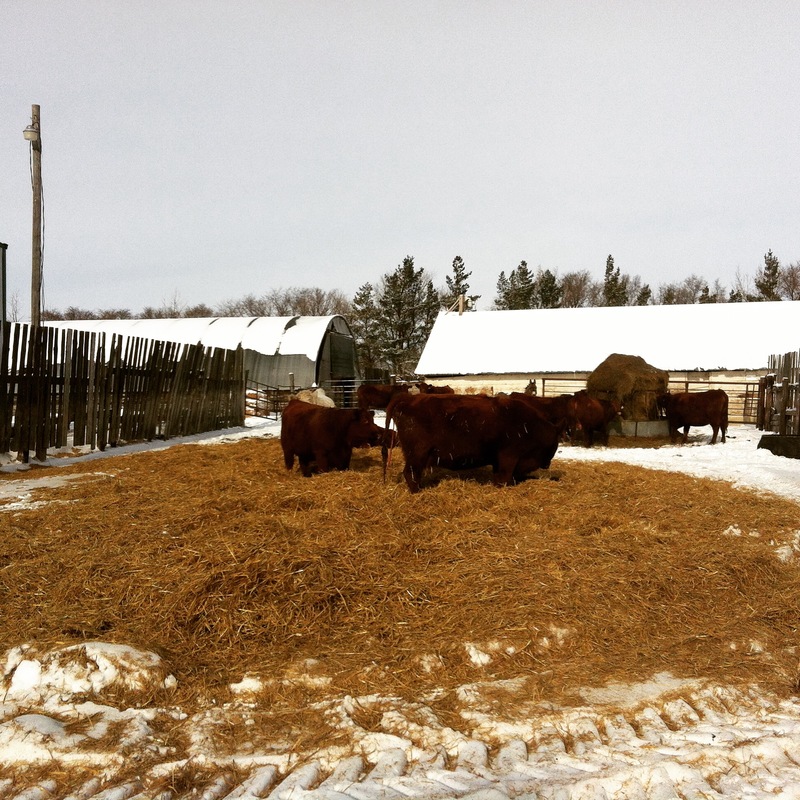 The cows are taken care of over winter in a pasture that is close to home and fed a diet that is formulated by my husband and myself (we are cattle nutritionists) to provide all the nutrients they need to for themselves and their babies. We also work closely with our herd veterinarian to make sure their vaccinations are all up to date. This makes for healthy babies and moms. 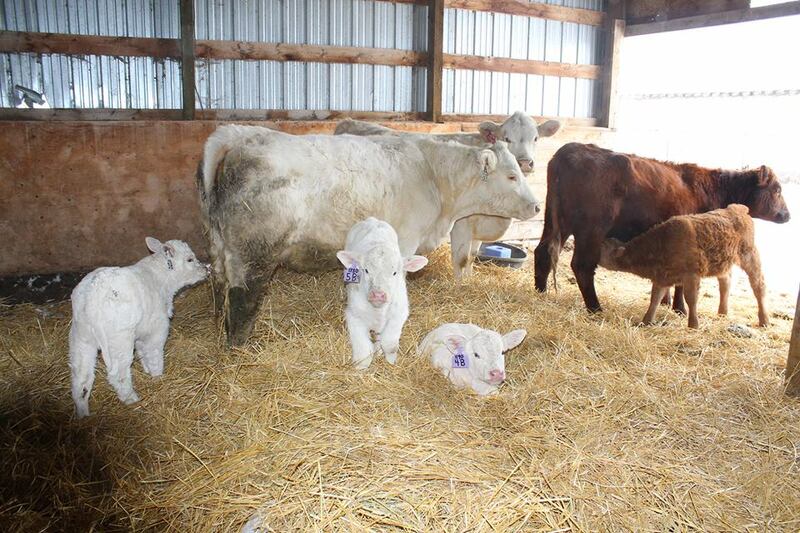 We manage our cattle so the first time mom gives birth a few weeks earlier than the rest of the herd. This gives us time to pay special attention to them, the barn is the cleanest so they have the lowest disease threat and it gives them more time to recover before breeding time in the spring/summer and more time for the babies to be at their side before the calves are weaned in the fall. We move the cows into specific groups – first time moms, special attention groups and by how close to calving they are. As they get closer to having their calves, we move these cows up to our yard into pen and when they are very close into our covered shed and barn to calving. We are very careful when moving the cows, a fall for a pregnant mom could be disastrous. We monitor our cows by video surveillance 24 hours a day to check on the cows. If a cow needs assistance in birthing, we bring her into our barn and will assist or have the veterinarian come for more complicated cases. The cow in the front has just calved (baby between her front legs) and was moved into the barn shortly after this was taken. Once baby arrives, we put the cow and calf into a maternity pen. Calves generally stand up very soon after birth (within 10 minutes) and cows lick off the calves. Licking the calf actually dries the calf and stimulate them to get moving. We make sure the calf nurses from the mother as soon as possible. A cows first milk is called colostrum and it is rich in nutrients and immune stimulating compounds that help the calf fend off illness until its own immune system further develops. Cows and caves stay in the barn for a day or two until they pass health checks and we confident they are bonded. 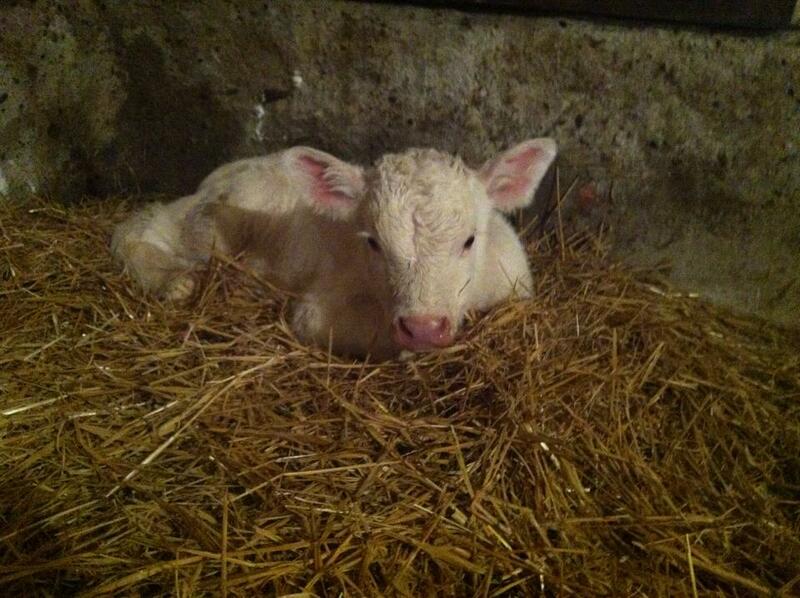 Baby Calf Incubator. It has a heater, fan and vents to warm up a calf quickly so he can be reunited with mama ASAP. 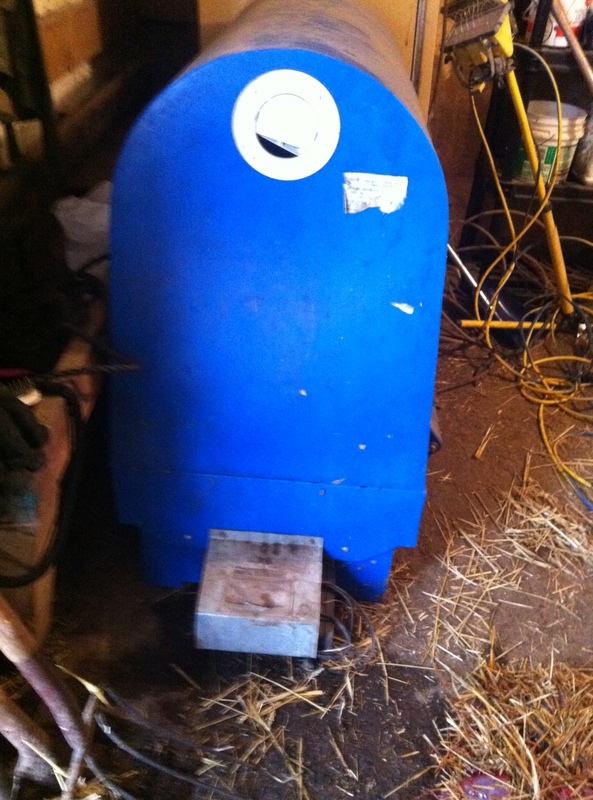 We also have an incubator in our barn in case a calf is born out in the extreme cold. Calves are warmed up and dried off in this unit for about an hour and reunited with their mothers as soon as possible. Cows and calves in open front shed. Afterward the pairs are put into pens where we have shelters for the calves to rest away from the elements. After about a month or so, the calves are big enough to head back out to our pasture field where we have wind fences and bedding for shelter. And finally in May they head out to pasture for grazing.